The transition you use is an aesthetic choice on your part. If you go with a 4 part transition then your shawl will be asymmetrical in color and the changes from skein to skein will be wider. 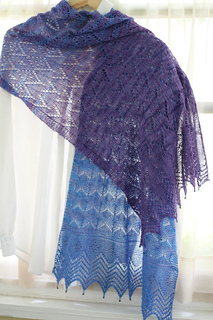 If you go with the 7 part transition you will have a symmetrically colored shawl, but you will have 6 transitions within the shawl instead of 3. The best way to do your transitions symetrically is by weighing the yarn and dividing the skeins into two equal balls – this way you can be sure that you will have enough yarn to make each half of the stole transition equally. If you are going to do 1-2-3-4 you’ll do your first transition at 11.75” (and this is measuring from the pickup). You won’t get to this point until Chart 3. 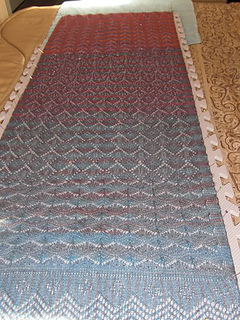 Then from skein 2 -3 at 29.5 inches then finally from 3 to 4 at 46.25 If you are doing 1-2-3-4-3-2-1 you will do the first transition at 3”, which should be after the 1st repeat of the Mohune Y chart. Then from skein 2 -3 at 12 inches then finally from 3 to 4 at 21”, 4 to 3 at 38”, 3 to 2 at 47” and finally 2 to 1 at 59” - all these measurements are unblocked.